In February of 2002 I purchased George W. Bush’s A Charge To Keep: My Journey to the White House. 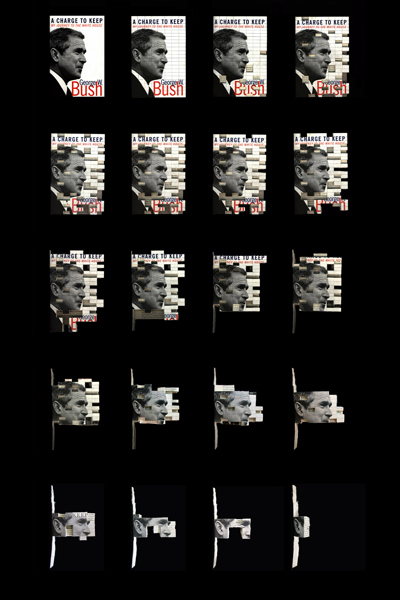 After buying the book, I drew a grid on it, and began to cut “chad-like” rectangles into the cover and pages. As portions of the book were cut and removed I recorded the printed words and ate them. 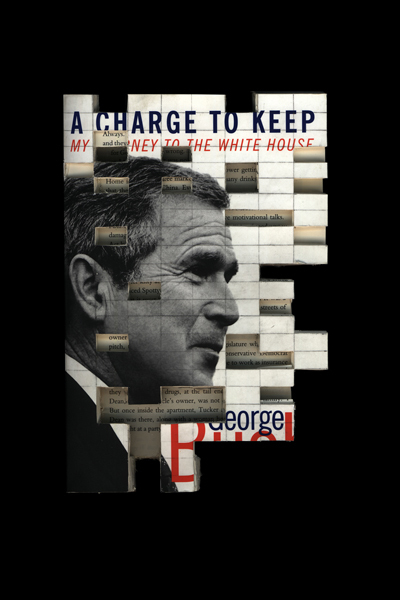 My “Charge To Keep” was to completely consume the book by the time Bush left office. During the 2004 election I thought I would have to hurry to finish eating the book but I was sad to discover I had more time to continue the project. Time has run out and I still have a small percentage left to finish. However, I decided I wish to retain the remainder of the book to remember this endeavor. I LIVED A WONDERFUL EXPENSIVE CELEBRITY WORLD… I WOULD TRAVEL IN A TOGA AND SEEKS A BIG GUSHER. WITH MY VICTORY I VERIFIED WE NEEDED SCHOOL AND GAGED LOVE IN TEXAS VOTERS CHILDREN. BEFORE THE CHILDREN I READ THE BIBLE REGULARLY. I TOLD THEM THAT GEORGE BUSH WOULD ENACT A SUPREME CARE PLAN OF CHANGE . . . IT WAS NO HALF JOKING POLL SESSION OR COSTUME PARTY. A SUPREME MAJOR GENERAL AND OTHER PEOPLE PROPOSED HIGH JOY. I VERIFIED THE ISSUE FOR GOOD AND I DIDN’T REALIZE ALL THE PEOPLE I UPSET. I FILLED OUT THE FIRST CABIN AFTERBURNER THAT FOR THE NEXT - THE FIRST - FOUR FOUR-THREE RESERVED. LATER, ORAL CABLE NEWS PUBLISHING BEGAN SCHOOLS, AND I… HEADED THE MOTHER PLANE INTO FLORIDA TO LECTURE AND EDUCATE THE COMMISSION. I GAVE TO THE HELP OF RWANDA AND BECAME THE OCEAN…. AND THAT BE THAT. I ate most of the book raw. Although I did occasionally include pieces of the book with Bologna sandwiches or with tacos. These are foods that George W. mentioned he enjoys. In 2003 I purchased one of the (now defunct) Miami Beach County voting booths on Ebay. This portable booth was used in the 2000 general election and utilized the now infamous “Butterfly Ballot System.” This method of voting relied on Floridians to punch perforated “chads” out of their voting cards in order to cast their votes. 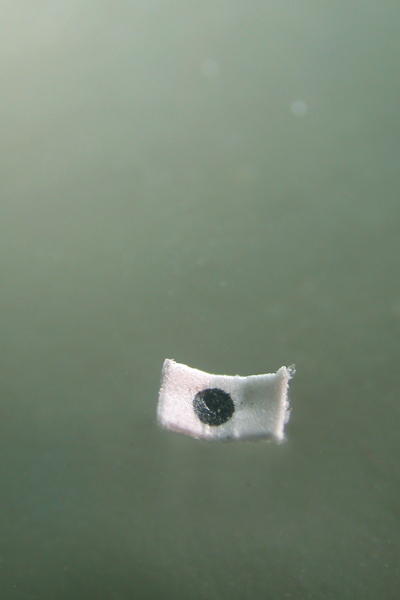 Many loose chads were scattered in the booth I purchased – these chads represent actual successful votes from the 2000 election. However, not all punches in the ballots were successful. The resulting confusion from Butterfly Ballots and bad practices at the polls caused the now infamous legal dispute here in Florida. I became interested in the chads I gleaned from my new voting booth and used them in a number of projects. 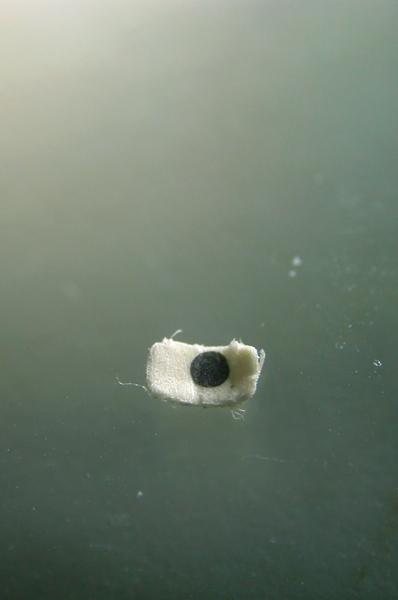 They are tiny objects that represent heavy political fallout. To me, they also seem to resemble miniature minimalist sculptures (or political minimalism). 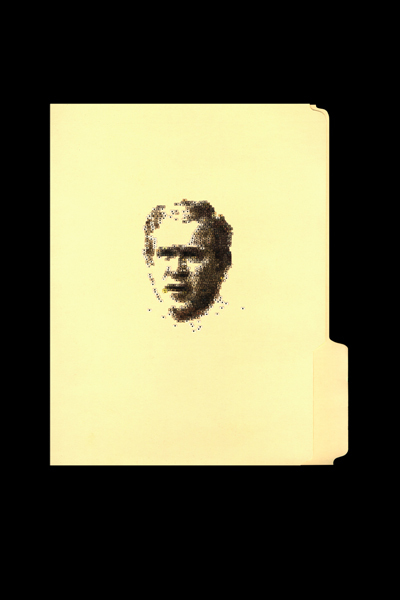 For one project I created an image of George W. Bush created from 200+ Chads dipped in different flavors of Bar-B-Que sauce. 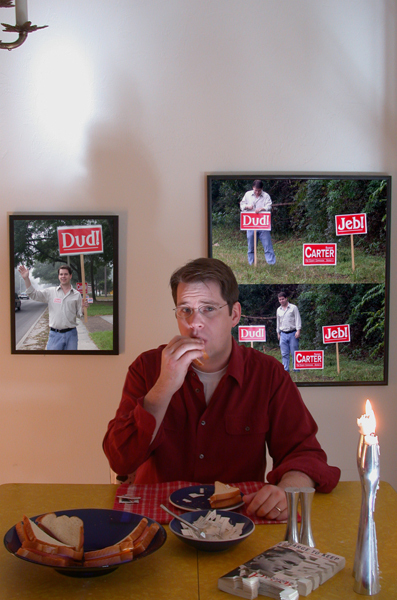 Another series involved individual photos of single Chads from the 2000 election. Images from these series were exhibited at the UICA (Michigan), SOIL (Washington), University Gallery at University of Florida, and at the Hardman Hall Gallery at Mercer University (Georgia). Images from the project were published in The Nation and The Gainesville Sun.